Although the brand was first introduced to baseball collectors, 2017 Panini Pantheon Football sees the high-end line move to the NFL. With all cards numbered to 99 or less, every hobby box comes with six autographs or relics. Immediately taking the set up a notch, the metal base cards are each limited to 50 copies or less. In addition, rare metal parallels include Gold (#/10) and Bronze (1/1) editions. 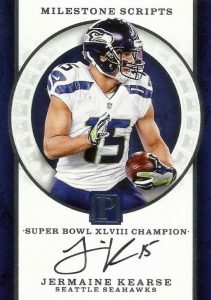 Working with several themes, and even some on-card signatures, the 2017 Panini Pantheon Football checklist offers top former and current stars. Among the hard-signed choices, Milestone Scripts honors the all-time greats while Pantheon Scripts Triple (#/5 or less) adds three relic pieces alongside the on-card autograph. Other signed inserts include Neophyte Calligraphy RPA cards for the newest rookies, the coach-based Mentors (#/49 or less), and Script 25,000 (#/49 or less) for the quarterbacks with a lofty career yardage amount. The other half of the hit equation, the 2017 Panini Pantheon Football memorabilia offerings are equally intriguing. 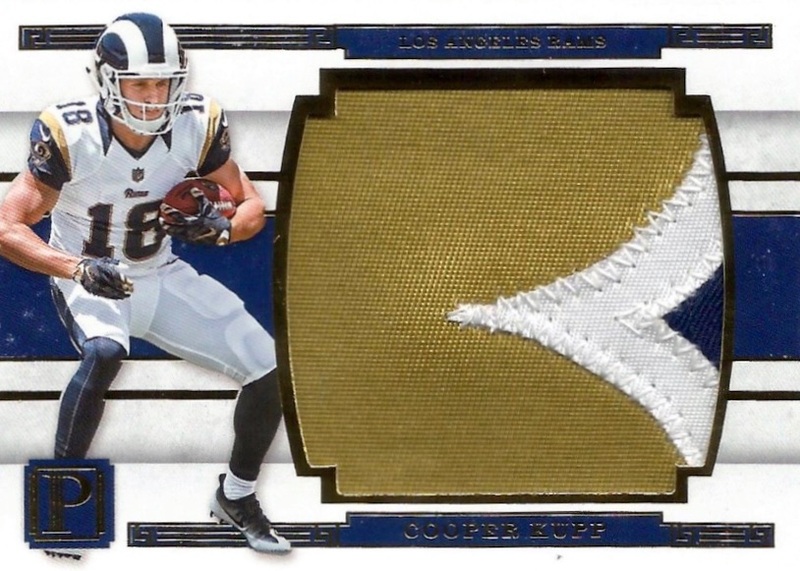 Mammoth Materials utilizes jumbo patches (2" x 1 7/8") for top 2017 rookies, and Legendary Monuments mimics the Mount Rushmore of football relics. Featuring the Greek word for teammate, Sympaiktis dual relics pair players with a direct connection. 2017 Sammie Coates Panini Pantheon JERSEY AUTO Card! SP# 56 99! + Tek RC! Mint! 100 cards. Serial numbered #/50. Shop on eBay. PARALLEL CARDS: Gold #/10, Bronze 1/1. PARALLEL CARDS: Gold #/99 or less, Bronze #/5, Holo Silver 1/1. PARALLEL CARDS: Gold #/25 or less, Bronze #/15 or #/3, Holo Silver 1/1. PARALLEL CARDS: Gold #/15 or less, Bronze #/2 or 1/1, Holo Silver 1/1. PARALLEL CARDS: Gold #/5, Bronze #/5 or less, Holo Silver 1/1. PARALLEL CARDS: Gold #/49 or #/25, Bronze #/25 or #/10, Holo Silver 1/1. PARALLEL CARDS: Gold #/10 or less (Lewis/Seau, Matthews/Brooks - #/49*), Bronze #/5 or less (Lewis/Seau, Matthews/Brooks - #/25*), Holo Silver 1/1. PARALLEL CARDS: Gold #/10 or less, Bronze #/5 or less, Holo Silver 1/1. PARALLEL CARDS: Gold #/49 or less, Bronze #/25 or less, Holo Silver 1/1. PARALLEL CARDS: Gold #/10 or less, Bronze #/5 or #/2, Holo Silver 1/1. *Card #6 found only in Holo Silver parallel. View specific parallel numbering with the full spreadsheet. 39 cards. Serial numbered #/99. Shop on eBay. PARALLEL CARDS: Gold #/49, Bronze #/25, Holo Silver 1/1. 7 cards. Serial numbered #/49. Shop on eBay. PARALLEL CARDS: Gold #/5, Bronze #/3* or #/2, Holo Silver 1/1. 88 cards. Shop on eBay. PARALLEL CARDS: Gold #/25 or less, Bronze #/10 or #/3, Holo Silver 1/1. *Ajayi found only in parallels. View specific parallel numbering with the full spreadsheet. PARALLEL CARDS: Gold #/25 or less, Bronze #/15 or less, Holo Silver 1/1. 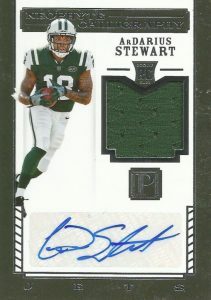 Panini is in the process of flooding the market of Kemp and Moss autos. They know this is a real crap fest so they show you a pic of a possible Randy Moss auto to entice the gamblers, those who cannot control their gambling addiction. Panini had a very nice 2016 with Dak & Zeke, so I can understand why they still prepare the 2017 mock ups with an RC on the card. Jokes aside, after Majestic this is the next cheeky product they throw to the group breakers and gamblers. Like I said before, jokes are on those who buy and not on Panini, they’re smart business people. For those who like just yet another theme in Pantheon, stay away of any breaks/boxes and just scoop up what you like on the bay for a few bucks. are any in college uniforms ???? Patrick: Arena Acclaimed is a dual relic for one player with an NFL image and a college image. Just did amazingly well in a 5 box pyt with the Saints, got 4 cards. One of them being an All Time Scoring Leader Morten Anderson auto, which I don’t see listed above. Unless my eyes are bad which is a legit possibility. Congrats, Michael! Morten is listed under the Milestone Scripts insert. Is this the one you are talking about? Yeah just rewatched the video to find it – card 28 thanks. Great looking cards but not for 325 a box. This product is nothing but Panini getting rid of old stickers and throwing in very few rookies and a bunch of retired players and coaches. Not much to collect here. Just ripped two boxes in the shop in the only thing worth any value is a quad patch numbered 2/2. Favre/Starr/Rodgers/R. White. This on paper looks pretty stellar selling currently for $210 a box. Collecting this and impeccable has been their most legitiment. 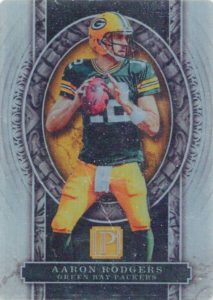 Great product, clean and interesting- 1 thing, I pulled the Superbowl Terry Bradshaw and it looks like the only card of the whole set that doesn’t list a print run- Any ideas? Love the metal base cards in this set. Really nice quality and a cool look! Can’t believe these metal base cards aren’t more popular. They are really cool looking and only 50 made with short prints of only 10 and 1 of 1! So a total of 61 metal cards made of each player is a pretty low print number. I am guessing that someday these base metal cards will be a hot item! Expensive and going up! I love the cards though. All LOW numbers! Started at $249 a box, now up to $325.00 Chasing Mahomes obviously.